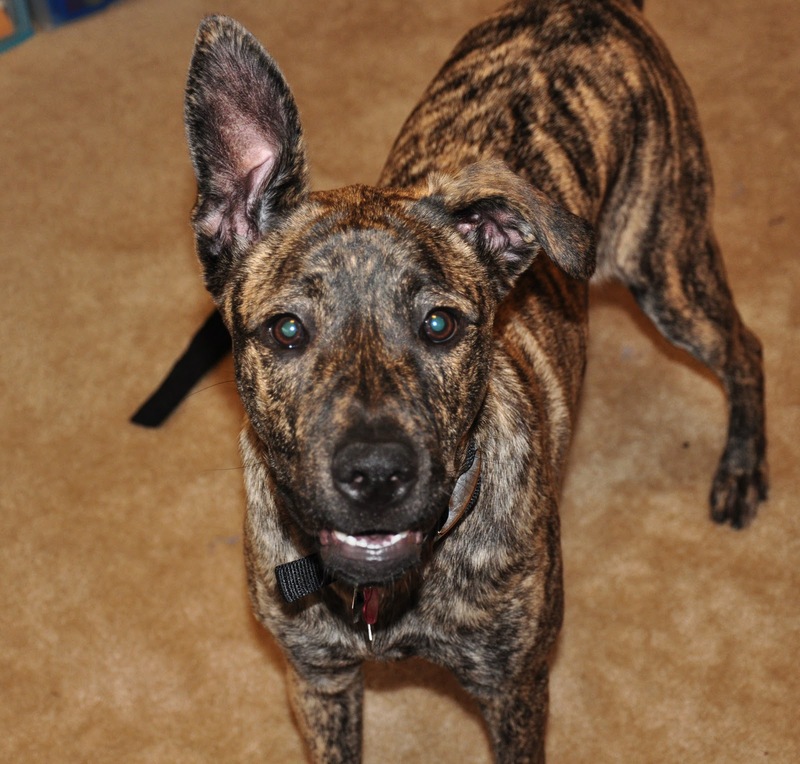 Leopold's Crate: Dogs and humans: dealing with the communication barrier. Dogs and humans: dealing with the communication barrier. I had originally planned a different topic for my next post. But as fate would have it, I had an experience in the wee hours of yesterday morning that felt prudent to share. There is a lesson my dogs have tried to teach me time and time again. And it’s always in retrospect when I think “Duh. I should have known. They were trying to tell me the whole time”. And that is that dogs are habitual creatures. They don’t often just suddenly change their behavior on a whim. It’s when something is out of whack that a dog will do something you’re not used to seeing them do. This happened yesterday morning. Leopold may be the first dog I’ve raised, but he’s not the only dog I currently have. My boyfriend, Chris, and I adopted a second dog about two months ago. Her name is Halo, and she’s still relatively young—about ten months old. Because Halo is not yet potty-trained, she sleeps locked up in her crate at night. Her crate lives (or at least lived) in our bedroom. “Halo’s whining” I repeated. I could tell Chris was irritated that I woke him up just because the dog was being annoying; it wasn’t the first time Halo had made enough noise to wake us up at night--just never by whining. But my state of consciousness had barely surfaced in a pool of sleep and it kept me from thinking too much about the situation. By the time Chris was awake, Halo had stopped whining, but had started scrambling around, scraping her cage. This kept Chris from getting back to sleep and eventually, when he had had enough, he got up and moved Halo and her crate downstairs to the kitchen. There. Now we wouldn't be able to hear the scraping. But that’s not what happened. She started to whine again. I remember thinking that she must merely be upset about being away from her people. Chris tried to lure sleep back by playing some soothing music. To no avail. And Halo’s whining actually got worse. Frustrated for a second time, Chris got up and went downstairs with a mind to move Halo and her crate to the basement, where she could make as much noise as she wanted without disturbing us. Something was clearly wrong. Had she gotten out and destroyed the kitchen? She’s almost gotten out of her crate before. And her knack for chewing and destroying things is quite amazing. The hypothesis was plausible. I called to see if Chris needed help. A definitive “yes” was his reply. Reluctantly I crawled out from under my warm blankets and hobbled down the stairs to the kitchen, eyes squinting at the offending light. The situation became instantly clear. Halo had been whining because she needed to go outside to do her business—and BAD. She was standing, horrified, in the middle of her own poo. Unsure how to proceed, Chris was merely holding her steady in her crate so that she would stop spreading the poo around. Together we managed to wipe off each paw as it came out of the crate and then Chris carried her into the bath tub to wash her feet more thoroughly. We wiped the crate's tray (thank goodness its removable!) to get the worst of it before heading to the deep sink in the basement to give it a good scrubbing. As I was standing there, Halo on the other end of the leash in my hand, I was suddenly shocked into angry yells as she squatted and pooed right there on the floor. Mind you, this poo was not solid and my scolding caused her to attempt to move away from the scene of the crime while she was still committing her crime, thus causing an arc of poo across the tiled floor. Oye…. I later found some vomit I had overlooked earlier near the first location of her crate—more proof that something hadn’t been sitting well in her stomach. In retrospect, I should have known something was wrong with Halo. I should have gotten out of bed when I realized her whining was unusual; I should have realized she was trying to tell me something. Instead, I lost two hours of sleep (more if you consider the low quality of the last bit of sleep I was able to snag before it was time to get up for work) and the entire house smelled of poo till late morning. The experience reminded me that communication between dogs and humans can be a difficult thing. And that any deviance from a dog's normal behavior could and probably does mean something. This was not the first time I have been punished for not listening to my dogs when they were trying to tell me something was wrong. Leopold, who is prone to gastrointestinal issues, has dropped loads near the door after failed attempts at getting me out of bed to let him outside.